Ryan Roberge makes a Maker's Mark Manhattan. Good food, good service and a funky, elegant ambiance in a converted 1908 Coeur d'Alene mansion: That's what 315 Martinis and Tapas Bar is serious about. But cocktails? 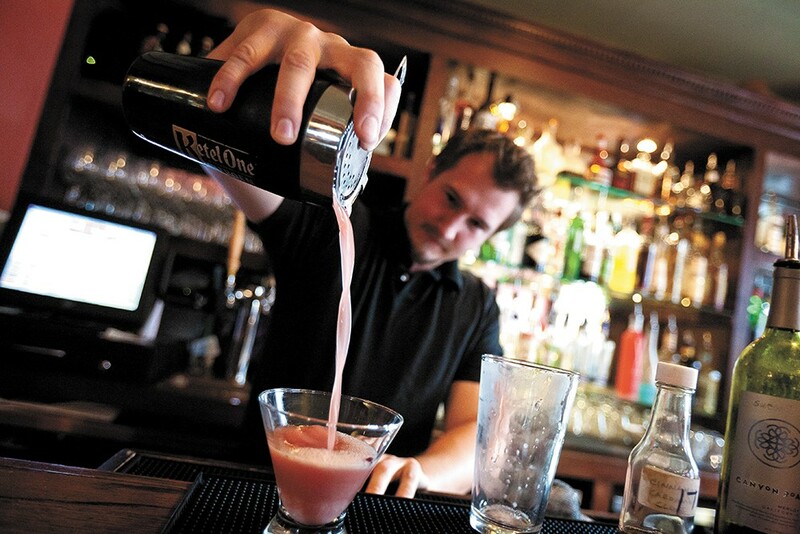 They like to have some creative fun with those, says server/bartender/manager Michael Irby. Dueling Banjos, for example, combines gin, Campari and St-Germain for a give-and-take on your palate, from bitter to sweet and back again. "We have a great respect for the classics and enjoy introducing people to them," says Irby. Popular drinks, says Irby, are the 315 Martinez and Basil Briar (a nod to Greenbriar Inn, the bed and breakfast of the same name; 315 occupies its ground floor). But new drinks continue to evolve, like Mr. Orange, an homage to Quentin Tarantino's 1992 cult-classic movie Reservoir Dogs. Turmeric gives the drink, which also includes ginger and cinnamon, its color. It was inspired by a soup recipe Irby made for his wife, who'd caught a cold, as well as Irby's research into healthful, turmeric-based teas. Simple syrup, vodka, carrot juice and bitters rounded out the flavor profile for the drink, a hit with judges at a past Martini Mix-Off, a fundraising event for a local arts program formerly held at the Coeur d'Alene Casino. Another competition, the Bartenders' Ball, spawned the Hibis-Kiss. Irby suggested blood orange, while another bartender — three barkeeps rotate shifts at 315, each of whom brings more than 10 years experience and a surplus of enthusiasm for the craft, says Irby — suggested hibiscus. A customer said it needed heat. Jalapeño was considered, but peppercorns won out. Kris McIlvenna, who started 315 from Greenbriar's catering business in 2008, provided the crowning ingredient: tonic. The result was a people's choice award at the Ball, an annual fundraising event held at the CdA Eagles Lodge. "These competitions are great because they keep us on the craft, and encourage us to push the envelope a bit more," says Irby. "It's great to win, but it's even better to create new customers."